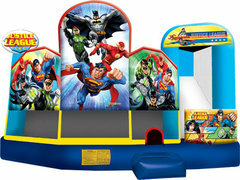 Description: The Justice League encompasses strength, power and courage in this energetic 5-in-1 combo inflatable jumper from KINDAS Jump. With five activities from which to choose, kids can practice their superhero skills alongside Batman, Superman, Wonder Woman, Flash and Green Lantern. This impressive Justice League 5-in-1 combo inflatable jumper offers colorful artwork at every turn, and is sure to draw quite a crowd.